Extended families, eh? What can you do with them? (Run as fast and as far away as you can is the best answer.) In the movies, there’s another answer: use them to ask questions about love and fate and dying and the meaning of a life, and much more besides. 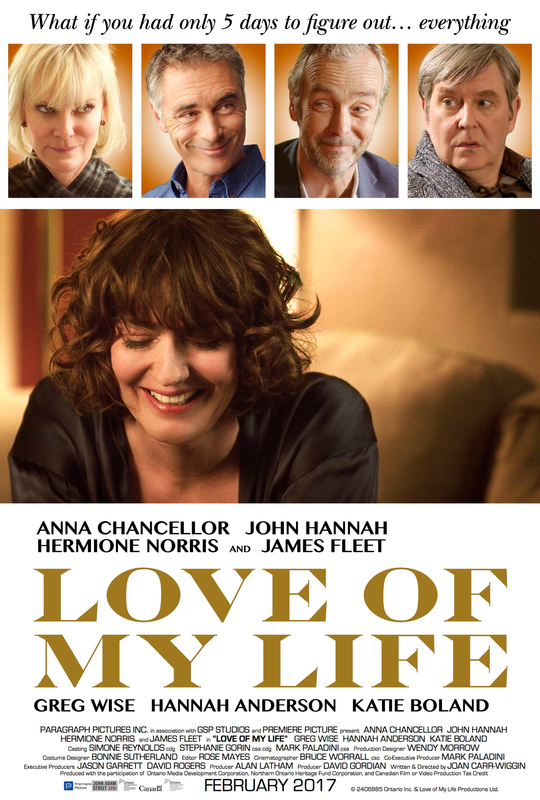 This is the main idea behind Love of My Life, an uneven look at what happens when a middle-aged woman, Grace (Chancellor), is told that she has a brain tumour that, hopefully, surgeons can remove in five days’ time – or maybe not. Grace is an architect, and she’s married to Tom (Fleet), her second husband after her marriage to prize winning author Richard Feekery (Hannah) broke down when he had an affair with Tamara (Norris). Grace and Richard had a daughter together, Zoe (Boland); she lived with her father who married Tamara. Grace married Tom and they had a daughter as well, Kaitlyn (Anderson). Now, Grace’s ill health brings them all together over the course of the few days before her operation. Everyone has a different reaction to the news, of course. Grace tries to be optimistic and carry on as usual, going to work and making sure that the latest project she’s overseeing continues as planned. Tom goes to pieces, and hits the bottle in order to numb his feelings of despair (and also because he’s a bit of an alcoholic anyway). Kaitlyn is concerned, obviously, but allows herself to be reassured by her mother. Richard turns up unexpectedly, professing his love for Grace and intent on winning her back. Zoe comes with him, and though she too is upset by the news, she has her own problems that occupy her thoughts more. And then Tamara arrives as well, convinced – correctly – that Richard wants to seduce Grace, while also suspecting that Grace wants him to. As the day of the operation approaches, old animosities and betrayals are aired with ever increasing frequency, relationships shift and slide in the wake of secrets revealed and feelings expressed, life changing decisions are made, and one character does something so irretrievably stupid and selfish that you can’t believe you’re seeing it. There’s definitely a lot going on, but is it enough? Curiously, the answer is sometimes yes, sometimes no, and it largely depends on which character is speaking at any given time. Grace is meant to be the voice of reason, the sensible one treading a median line through all the tantrums and the emotional wreckage that’s been cast up by the news of her tumour. She’s also the audience’s connection to the material, and how she behaves governs how the audience responds to it all. She’s attractive, intelligent, has terrific relationships with her daughters, can be self-deprecating when needed, clearly loves Tom despite his being a bit of a bumbling, blithering idiot (note to casting directors: is James Fleet the only actor who can play these roles? ), and comes to realise that the work she’s doing as an architect hasn’t been challenging her – so she changes things for the better. In essence, she’s exactly the kind of person you’d want to be if you found out you have a brain tumour that might prove to be inoperable. In the capable hands of Anna Chancellor, she’s also witty, charming, and a delight to spend time with. But this is the movies, and inevitably, there have to be challenges, obstacles for Grace to overcome on her way to the operation. And this is where the movie begins to wobble. If we had been presented with a portrait of a woman whose illness prompts her to reassess her life and change things for the better, this could and should have been a warm, endearing movie about the power of self-belief and second chances. That would have been a drama worth seeing. Instead, we have a “dramedy” where Grace (and the audience) has to contend with a collection of supporting characters who, Kaitlyn aside, are self-indulgent, self-important, and relentlessly self-flagellating in their efforts to make you feel sorry for them. Richard is the misunderstood genius – with words at least – using every trick he knows to remind Grace of the wonderful time they had when they were married, as if all that negates the affair he had with Tamara. Richard’s level of self-interest is at least consistent, and is actually more convincing than when he begins to reveal a more sincere, and more soulful side to his relentless self-aggrandising. At least, though, some effort has gone into writer/director Joan Carr-Wiggin’s script into making Richard at least halfway interesting, and something of an acceptable foil for Grace’s more credible behaviour. If there hadn’t been that effort, we would have been left with a handful of supporting characters seemingly designed to test our patience and our sympathies. Tom is, as already mentioned, a bumbling, blithering idiot, and he behaves stupidly throughout, making you wonder why Grace is with him in the first place. Tamara, played by Norris as a combination of Wicked Witch and jealous harpy, is manipulative in a way that can only be regarded as comic, while Zoe might as well have “airhead” tattooed across her forehead, such is the vacuity that she expresses at pretty much every turn. Kaitlyn survives by virtue of being as level-headed as her mother, something that the viewer has to be thankful for, as the only other character of note is Grace’s boss, Ben (Wise), who she may or may not have hidden feelings for. Seeing these characters interact so ungraciously, and with scant regard for each other’s emotions or histories, isn’t very appealing, and Carr-Wiggin rarely stops them from trying to impose their own ideas and desires on each other, and without any moral imperative to stop them (that Grace has a brain tumour and might just die seems to carry no weight at all with any of them). The script does try to make some informed (or what seems like informed) comments on life and love, and envy and lust and regret, but it does so in such a way that any effect is muted by the attitudes of the characters. There’s always a degree of sermonising in this kind of movie, and it’s often trite and unprepossessing; Love of My Life embraces this kind of posing and tries to be relevant and incisive all at the same time. That it’s not successful in its aims is purely down to the way in which Carr-Wiggin manipulates her happy bunch of malcontents into acting and sounding like children who’ve been naughty and had their favourite toy taken away as punishment. Against this, only Chancellor and Anderson emerge unscathed, with Chancellor proving that she’s a much better actress than the material she’s working with, and Anderson giving a measured performance that some of her more experienced co-stars could have done well to adopt for themselves (to be fair, though, Hannah tries his best, and gives an earnest portrayal as Richard, but he’s just not sympathetic or likeable enough for anyone to care). In the end, what happens to the people orbiting around Grace fails to engage the viewer, and this takes away from learning more about Grace herself, and what makes her (actually) so intriguing. Rating: 5/10 – with some obvious humour, a spirited if slightly curtailed performance by Chancellor, and a jumping off point that could have led to something more, Love of My Life ends up being yet another movie where a number of self-absorbed characters bemoan their lots in life – and as if this was anywhere near interesting; a muddled time frame doesn’t help (there are moments when five days seem to be four), and a dull, uninspired visual design helps even less, leaving the movie feeling less than the sum of its parts, and straining too hard to be relevant or meaningful.